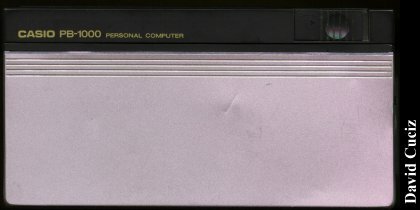 An MD-100 3.5" floppy drive was also available. I bought this "palmtop" when the term wasn't still in use. It served me well through high school, college (for data gathering and analysis during laboratory work) and even military service (for simple weather forecasts). The PB-1000 packed a heavy punch. Its built-in C61 BASIC includes a wide range of mathematic, trigonometric and statistic functions, and in order to calculate one you don't even have to write a program: simply enter the function and press the IN touch-key; OUT will output the function for editing and CALC will ask for the values to be calculated and print out the results. Calculations entered in CAL mode would be carried out instantly, and you had to resort to programming only when confronted with specific and more complex tasks. The Command Reference handbook defines C61 BASIC as based on Japan Industrial Standard BASIC C6207, although I don't have any idea of what JIS BASIC is exactly like. The CPU is a custom HDS61700 LSI, which includes the processing unit, 32 bytes of RAM and 3072 words of ROM on a single chip. It wasn't exactly fast (half the speed of the desktop machine I had in high-school, which was a Commodore C128) but it beat other handheld programmables I had known hands down. It number-crunched its way through linear systems, differential equations and the like with ease, and it also ran a couple of programs I had designed on the C128 for Physics and Chemistry work. It is possible to write Assembly programs on the PB-1000 via a simple editor, and then to run them using the integrated compiler. The PB-1000 sports a programmable touch-sensitive display which contributes to its overall ergonomy (even if it means having to clean the screen very often); its RAM is organized like a mini-disk (thanks to the 3 AA cel ls that power it, the PB-1000 can retain its memory when turned off for months) and up to 4 programs can be selected for immediate use through the touch-screen; one more can be launched at startup and it is possible to prime the computer to start a program at a specified time and date. Since I tended to lose this little handheld very often in my cluttered room, I wrote a simple BASIC programs which would "wake up" every day at noon, increment a variable by one and then return to "sleep" (the computer turns itself off if it isn't used for 5 minutes); when the variable was at 3 or more, it meant the Casio hadn't been used in 3 days or more, which meant I couldn't find it (another program that booted up when I physically switched it on reset the variable) and then it would "beep" for a minute and a half allowing me to find it. 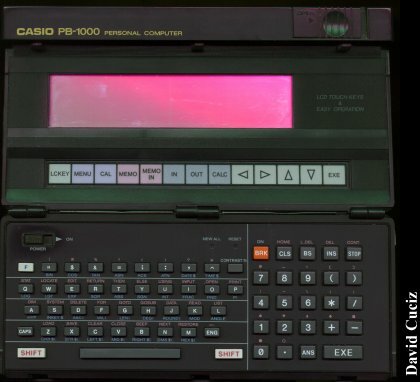 Notes can be entered in the Casio PB-1000, but the lack of sorting and editing facilities meant it was of very limited use as a PDA (unless of course, you wrote your own PDA software); its password-protection feature, moreover, was useful only to prevent unauthorized individuals from listing or deleting your programs. It didn't protect data files and it couldn't stop anyone to press the NEW ALL button which would irrevocably delete all memory contents. The PB-1000, as I recall, was followed by the PB-2000 which boasted a C-like programming language, but as of now it seems very few data on it can be gathered. A shame, really, because it was a powerful small machine for its time. Click here to view all comments for the Casio PB-1000 and to leave your own. 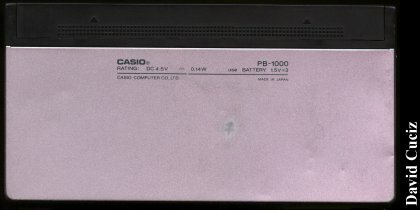 Click here to view comments about other Casio computers.